This year the workshop topics included: flooded mine wastes; waste characterization and prediction of drainage chemistry; and mitigation case studies. The workshop consisted of 23 presentations and included issues in Germany, Australia, Peru, United States and various areas of Canada. Morin N. Tahltan Perspective - ML/ARD. 20th British Columbia MEND Metal Leaching/Acid Rock Drainage Workshop. Vancouver. 2013. Tremblay G. and C. Hogan. Update on MEND and NOAMI (2013). 20th British Columbia MEND Metal Leaching/Acid Rock Drainage Workshop. Vancouver. 2013. Price W. Overview of Flooding to Minimize Metal Leaching and Prevent Acid Rock Drainage. 20th British Columbia MEND Metal Leaching/Acid Rock Drainage Workshop. Vancouver. 2013. Pedersen T.F., A.J. Martin and D.H. Flather. When Politics Trumps Evidence: The Misguided Prohibition Against Underwater Tailings Disposal. 20th British Columbia MEND Metal Leaching/Acid Rock Drainage Workshop. Vancouver. 2013. Small A. CDA Mining Dams Bulletin. 20th British Columbia MEND Metal Leaching/Acid Rock Drainage Workshop. Vancouver. 2013. Larratt H. and M. Ohata. Overcoming Hurdles and Unexpected Help in Maintaining Tailings Ponds as Wetlands, Fisheries and Bioreactors at Highland Valley Copper, BC. 20th British Columbia MEND Metal Leaching/Acid Rock Drainage Workshop. Vancouver. 2013. Larratt H. and P. Martell. Overcoming Low Productivity of Pit Lakes used as Bioreactors and Fisheries at Highland Valley Copper, BC. 20th British Columbia MEND Metal Leaching/Acid Rock Drainage Workshop. Vancouver. 2013. Martin A.J., D. Gelderland and T.F. Pedersen. The Geochemical and Biological Recovery of a Gold Mine Polishing Pond (Balmer Lake, Ontario). 20th British Columbia MEND Metal Leaching/Acid Rock Drainage Workshop. Vancouver. 2013. Herbert R., C. Roche, J. Gjertsen and D. MacGregor. Minto Mine - Operational Experiences Managing Waste to Reduce Potential for Acid Rock Drainage. 20th British Columbia MEND Metal Leaching/Acid Rock Drainage Workshop. Vancouver. 2013. Lapakko K. ASTM D5744 Kinetic Test Method Status and Application and Application. 20th British Columbia MEND Metal Leaching/Acid Rock Drainage Workshop. Vancouver. 2013. Campbell G.D. Twenty-five Years of Mine Waste Characterisation in Western Australia: Overview of Testwork Approaches. 20th British Columbia MEND Metal Leaching/Acid Rock Drainage Workshop. Vancouver. 2013. Shaw S., J. Misiewicz, L. Gutierrez and L.A. Sanchez. The Geochemical Field Barrel Program, Cerro Corona Mine. 20th British Columbia MEND Metal Leaching/Acid Rock Drainage Workshop. Vancouver. 2013. Day S. Evaluation of Factors Affecting Porphyry Mine Drainage Chemistry. 20th British Columbia MEND Metal Leaching/Acid Rock Drainage Workshop. Vancouver. 2013. Nicholson R.V., S. Barabash, M. Venhuis, G. Ivanis and G. Shen. Integration of Field Investigations and an Innovative Modelling Tool in the Prioritization of Mitigation Strategies for an Abandoned Uranium Mine. 20th British Columbia MEND Metal Leaching/Acid Rock Drainage Workshop. Vancouver. 2013. Walker S.R., J. Millard, J. Andrina and S. Sibbick. Predicting ML/ARD from Low Acid Potential and Low Carbonate Neutralization Potential Rock; Baffinland Iron Mines Mary River Project, Nunavut, Canada. 20th British Columbia MEND Metal Leaching/Acid Rock Drainage Workshop. Vancouver. 2013. O'Kane M., B. Ayres, L. Barber, D. Hiller and D. Helps. Performance of an Engineered Cover System After Six Years at the Areva Resources Cluff Lake Mine Waste Rock Pile in Northern Saskatchewan. 20th British Columbia MEND Metal Leaching/Acid Rock Drainage Workshop. Vancouver. 2013. Sencza W. Golden Giant Mine Closure. 20th British Columbia MEND Metal Leaching/Acid Rock Drainage Workshop. Vancouver. 2013. Small A., J. Pugh, J. Stroiazzo and I. Walton. 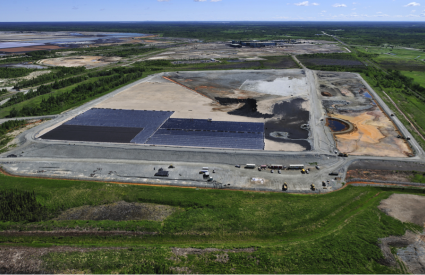 Closure of Jarosite Pond Facility, Timmins, Ontario: Design and Construction. 20th British Columbia MEND Metal Leaching/Acid Rock Drainage Workshop. Vancouver. 2013. Paul M. and A. Kassahun. The German Wismut Environmental Remediation Programme - Status Achieved and Challenges Remaining. 20th British Columbia MEND Metal Leaching/Acid Rock Drainage Workshop. Vancouver. 2013. Kassahun A., U. Jenk, J. Meyer and M. Paul. Wismut's Mine Water Management and Treatment Approaches. 20th British Columbia MEND Metal Leaching/Acid Rock Drainage Workshop. Vancouver. 2013. Schwenger R. Unexpected Events at Closed ARD Sites. 20th British Columbia MEND Metal Leaching/Acid Rock Drainage Workshop. Vancouver. 2013. Laurencont T. and M. Rider. Rum Jungle - Investigation of Future Rehabilitation Requirements. 20th British Columbia MEND Metal Leaching/Acid Rock Drainage Workshop. Vancouver. 2013. Laurencont T. and M. Rider. Evaluation of Future Rehabilitation Strategies for the Rum Jungle Mine Site. 20th British Columbia MEND Metal Leaching/Acid Rock Drainage Workshop. Vancouver. 2013. Stockwell J., G. Gilron and A. Marton. Coal Mine Planning and Selenium in British Columbia. 20th British Columbia MEND Metal Leaching/Acid Rock Drainage Workshop. Vancouver. 2013.